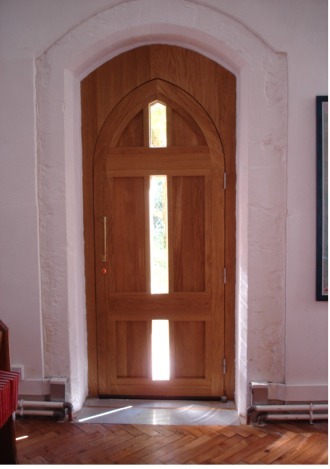 The timeless beauty of Oak is highlighted in this modern creation in a traditional style. 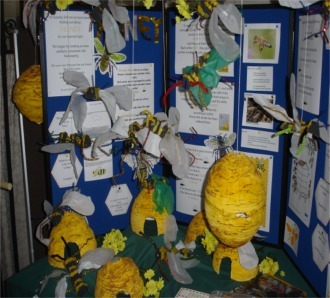 The marvels of Buzzy-Bee Honey-making - Buzz if you like but save some for me !! St. Mary's Church was built some 700 years ago, in the early 13th Century, almost certainly on the site of a Saxon church. 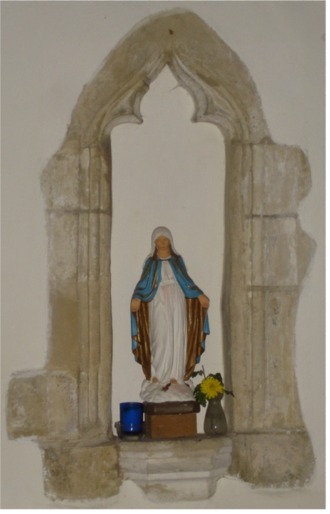 The title "St. Mary our Lady" was the traditional way of which St. Mary was known in England. The style of the building is early English, which has been described as "engineering in stone", because of its simplicity and the way, without embellishment, it so meets the purpose for which it was built. The church was initially, bigger, as the Chancel extended beyond the bounds of the existing east wall. There were two Chantry chapels and, possibly, two aisles built in the 14th century. 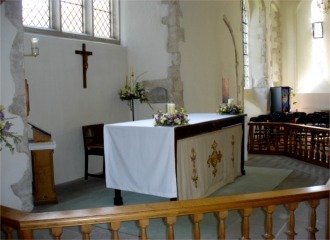 There was also a Vestry to the north of the Chancel area. At this time St. Mary's was, very likely, the largest church in the area. The north chapel and part of the Chancel were allowed to fall into ruin, probably in the early sixteen hundreds, but were rebuilt, using much of the original materials, shortly after 1660, when the Monarchy was restored after the Cromwellian period. During this rebuilding, the east window was moved to the present position, giving the church the unusual T-shape it now has. 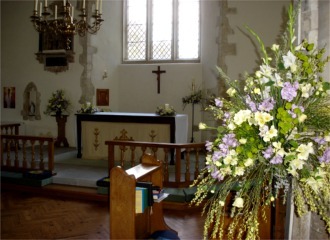 The Chancel area is, traditionally, the responsibility of the Vicar, the remainder of the building being that of the Church Wardens. It seems possible that, at some time, there has been disagreement about this since, to make it absolutely clear, two small square stones, inscribed "Chancel Boundary, 1814" were inserted in the eastern columns. The niches ( or piscinas ), adjacent to the Altar, are original and were used for the cleansing of the holy vessels, after the celebration of Holy Communion. 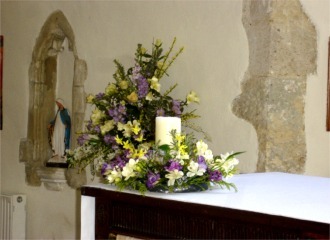 Recently, an aumbry has been built into the wall, adjacent to the Altar. In it is kept the Blessed Sacrament. For many of the centuries during which the church has stood, the majority of the parishioners were unable to read. 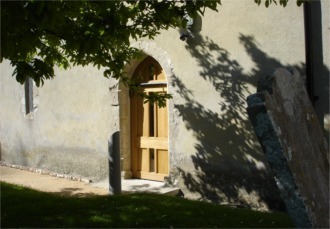 To overcome this problem, a Mass Dial, which indicated the time of a service, was cut into an outer stone of the south door ( now reopened ). The dial can, if you look hard, just be seen. In the 15th century, the tower was added, complete with a minstrel's gallery ; at the same time bells were hung - James the tenor, weighing nearly half a ton, and an unnamed treble weighing a little less. From that time, until 1850, music for the services was provided by a village orchestra, comprising flute, fife, bassoon and fiddle. 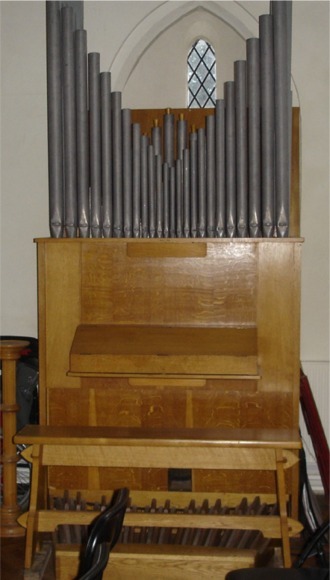 Two of these instruments are still held in the church. 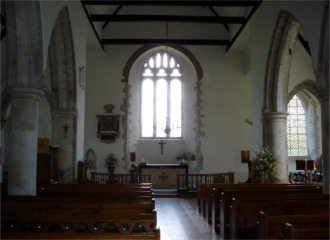 During the Middle Ages, the nave must have been very dark, as the only light came from the three narrow windows in both the north and south walls and two in the west wall. In 1596, three of these windows were converted to the oblong windows you now see. Alongside the new window, on the north wall, the workman could not resist adding, for posterity, his initials ! The Font, adjacent to this window, is about the same age as the church and is typical of early Sussex work. It was removed from the church, during the Civil War and its weatherbeaten and rather battered appearance may be the result of it having been buried during this time. It was re-erected in 1660. You will see that there is a drain, from the font, which discharges just above the tiled floor. An Edict requires that the water in the font, which has been blessed, should be collected and cast away outside the church. In the old days, it was suspected that if this action was not taken, the water might be used for witchcraft purposes. The era of the Cromwells led to many upheavals throughout the Church. A possible victim is the charming Taylor memorial, on the east wall. Although the death of the wife is fully recorded, the space above, obviously intended for an entry about the husband, has never been completed. Why ? 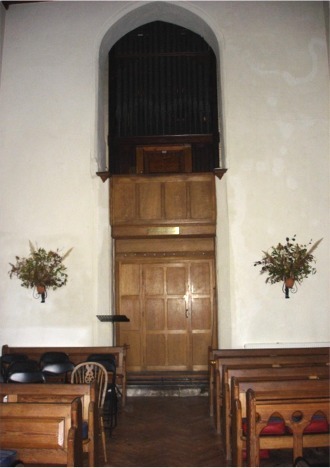 In the 18th century, side galleries and large box pews were constructed : the incisions to support the galleries can be seen, cut into pillars. It seems likely that, to compensate for the reduction of light, led to the villagers subscribing to the splendid brass candelbrum, installed in 1750. It is, of course, still used on special occasions. At the same time, to add further to the lightness, dormer windows were built in the roof. The iron screen, in the north chapel, is a fine example of the work of Sussex blacksmiths. It was worked, one imagines, lovingly, just before the Battle of Waterloo, in 1815. In 1850, the live music was replaced by a harmonium - a new invention. 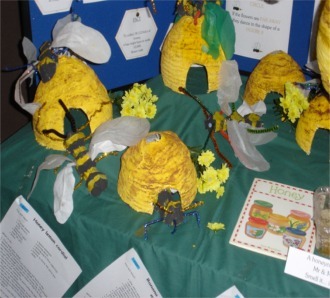 That must have resulted in a few discussion groups ! In 1890, radical changes were made and much renovation carried out. The box pews and the galleries were removed, the wooden block floor was laid and an organ was installed in the north transept. In the early twenties of this century, a fund was started to pay for urgent repairs to, in particular, the tower, north transept and the Altar window. This work was delayed, owing to World War II, and was finally carried out between 1950 and 1952.
problem since the choir was, no longer, immediately adjacent to the organ. To overcome this, the choir now sits at the back of the church. Since 1953, much renewal and refurbishment work has been done. A comparatively recent record of benefactors will be found in the large book in the recess of what was the south door ( now relocated ). 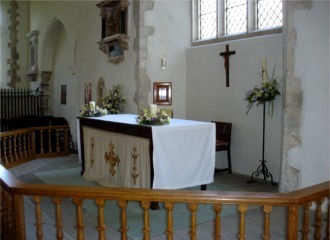 The pulpit, for example, was the gift of seventy parishioners. 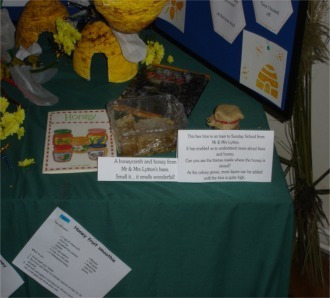 The Altar, which was also presented by a parishioner, has an interesting history. 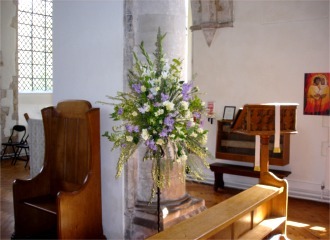 It was originally used as a side table, in the house of the donor, in Antigua, British West Indies ; he brought it back to England with him and it now graces our church. In the summer of 1989, the whole of the stonework surrounding the window behind the Altar was replaced - at some considerable cost. 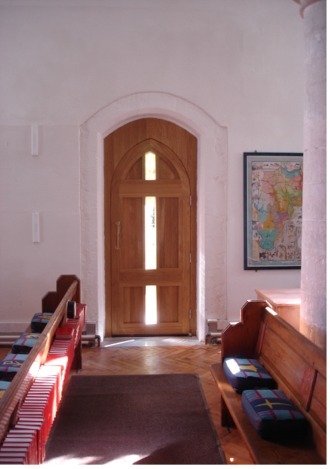 The work was carried out by the stonemasons of Chichester Cathedral, whose expertise is recognised world-wide. 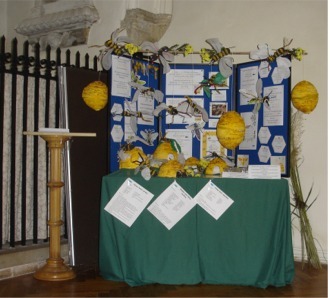 In 1992, work had to be put in hand to re-roof the church ; The cost of this was many, many thousands of pounds most of which was met by the parish, and the generosity of individuals. The Vicars of the parish, which covers over sixteen square miles, are listed on a board on the north wall, close to the Vestry. There is little doubt that we owe much to them as, without their leadership and encouragement, it is hard to believe that this venerable church would be as you see it now or even that it would still be standing. The church is to us, the villagers, a source of pride and a place of comfort, in both good and bad times. It is not only a House of God but a history, in wood and stone, of centuries and a monument to the many hundreds of parishioners who, over the years, have demonstrated their faith not only in spiritual but in financial terms and in many other ways. St. Mary's is a living building not a museum. We hope that you have enjoyed your visit and that it has provided a peaceful and refreshing interlude in these turbulent and stressful days. 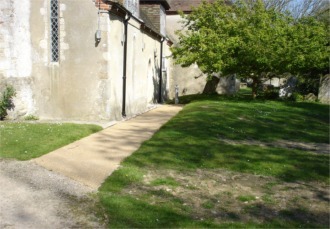 Not shown on the plan of the church is a small metal box, for alms, inserted in the north inner wall, quite close to the Vestry. Any contribution which will help St. Mary's to continue to serve its purpose for, we hope, many more centuries, will be most welcome. © St. Mary's Church 1995.